A woman has been ordered to pay compensation to her former boyfriend after ripping a testicle out of his scrotum with her teeth. 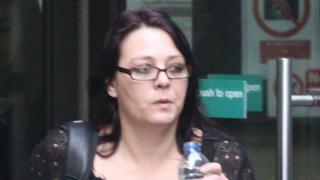 Nunzia Del Viscio, 43, carried out the attack in her victim's flat in Edinburgh in May last year. She claimed she had been acting in self defence, but was convicted of assault. Del Viscio has been placed on a restriction of liberty order for six months, which means she must stay at home between 22:00 and 06:00. Appearing for sentence at Edinburgh Sheriff Court, she was also ordered to pay her victim £500 compensation. Sheriff Peter McCormack heard that those involved in the incident were Italian nationals, all working in restaurants in Edinburgh. Del Viscio, Mr Palma and two other people met in a nightclub after work. They had been drinking, and Del Viscio admitted to having taken drugs. When the nightclub closed, all four went to Mr Palma's flat in a taxi. Mr Palma told the court that in the early hours of the morning, Del Viscio had begun "destroying" one of the bedrooms. He said he told her to calm down and leave, but during the argument she bit his left testicle. He said he tried to stop the flow of blood with a towel and called for an ambulance. He was taken to Edinburgh Royal Infirmary, where his testicle was put back into the scrotum and he was given 15 stitches. Police found Del Viscio outside the flat with blood on her teeth and face. She had injuries to her eyes and bruising on her face, and told officers that she had been hit by Mr Palma. Police said he had been "fairly distraught", and that a bedroom was in a state of disarray, with pools of blood on the floor. During the trial, defence solicitor Philip Templeton, asked Mr Palma if he had caused injuries to his client's eyes and face. He admitted that he did, but said he had been attempting to stop Del Viscio biting him. She told the court that she had wanted to escape from the flat, but that Mr Palma had pushed her onto the floor and began punching her. Del Viscio said: "As he came to me I bit him. I just remember a noise and blood pouring into my mouth." Defence solicitor Philip Templeton said there was a low risk of his client re-offending. He said she led an otherwise productive life with a good record of employment, and that the incident had been caused by alcohol and drugs.